We have all seen large photovoltaic solar panels on top of roofs or in array fields generating many kilowatts of free electricity. But there is another form of solar energy that has started to emerge called pico solar or pico pv, that uses small compact and light weight solar photovoltaic panels to generate just a few watts of power in a wide range of small and portable applications. Pico Solar Systems are becoming more common place with us using pico solar cells in our daily lives without even knowing it. Pico solar systems are much smaller and cheaper than traditional solar systems but have the potential to provide useful amounts of electrical power to charge the increasing number of low power gadgets such as calculators, toys, cameras, mp3 players, cell phones, tablets, and other portable electronic devices etc, as well as a variety of chargers all use pico solar cells to charge batteries. Photovoltaic solar cells now come in various shapes and sizes and pico solar, “pico” meaning very small, is an emerging new category, along with micro solar and nano solar, of low power solar photovoltaic electric system which has a lot of potential to power low power LED lighting to light up millions of homes in much the same way that cell phones have connected people and communities around the world. Solar energy is about reducing our reliance on fossil fuels and pico solar systems can be used to provide power to a wide range of applications. As their name suggests, pico solar systems are much smaller than traditional solar home systems generating just a few watts to power light emitting diode (LED) lights and a wide range of energy efficient portable devices. Typically, pico solar cells have power outputs ranging from as little as 0.1 watts-peak (Wp) to 5 watts-peak for powering smartphones, portable devices or recharging batteries while systems up to 15 or 20 watts-peak are used for powering larger devices, multifunction systems and home use. A typical pico solar system generates relatively small and safe amounts of electricity of about 5 volts, affectionately called “pico power”, which means that the amount of electricity generated by a Pico Solar Charger is low but can still be incredibly useful for people travelling or without access to a mains powered charger. While the uptake of traditional solar photovoltaic systems for powering our homes is increasing, the key barrier which hampers its rapid expansion across the world is the cost of the installation. While traditional solar PV systems can save homeowners a great deal of money over time, the upfront cost involved in purchasing and installing a system is often too much preventing people from adopting solar power. However, a smaller, less expensive, pico solar systems have the potential to overcome this barrier as pico-PV and small scale solar systems are much more affordable and easily accessible for many people around the world. Also being small and portable, pico solar systems are relatively easy for non-specialist shops and distributors to physically stock and sell pico solar products plus you do not need specialist technicians to install. Just buy, plug-in and switch on. A pico PV solar module usually less than 20 watts-peak to capture the sun’s light to generate the electricity. Rechargeable dry-cell battery or batteries of less than 12 volts to store the solar power for use when needed. Some form of charge control and battery management circuitry to protect the battery or batteries from overcharging or deep discharging. Power plugs and cables to connect and power devices such as phones, tablets and external lights. Internal lighting as most pico chargers now come with small highly efficient LED lighting built-in as standard. While there is a growing market for portable pico solar chargers which can charge up devices such as phones and portable devices, there is an even bigger market for pico solar lighting for the home and garden. Off-grid solar lanterns for use in a solar garden or as garden shed lighting have developed significantly in the last few years, and with the use of very energy efficient lights (mainly LED’s), charge controllers built-in lithium-iron (Li-Ion) batteries, and a pico-PV panel of only a few watts can light a whole area of the garden at night. The development of LED’s by the Electronics industry is still ongoing as the technology continues to evolve. But LED’s and especially white LED’s and organic LED’s or OLEDs, are becoming a long lasting and cost-efficient alternative to many so called energy efficient lamps helping the pico solar lighting to develop further along with improvements in storage battery and solar panel technology. The rapid introduction of small portable devices such as the smartphone, tablets and e-reader, which operate consuming relatively small amounts of electrical power, has increased not only the number but the different types of portable electronic devices that pico solar systems can power. Today, there is an increasing number of small portable devices which have an integrated solar module and rechargeable battery built into their design, and some even use rechargeable mobile phone batteries instead of traditional disposable batteries to operate allowing it to be recharged from any pico solar system. But in order for a portable device to operate using a pico solar system, it must by designed to consume very low amounts of electrical power and be able to operate using smaller DC voltages as pico solar systems only generate DC electricity directly without the need for transformers and large bulky power supplies that convert the mains AC voltage to DC. 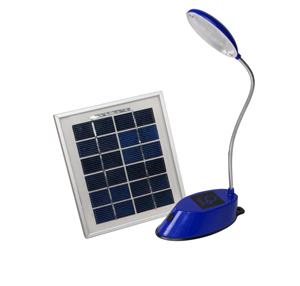 Larger pico solar systems and lanterns operate using 12VDC, whereas other, smaller power systems mainly operate using just a 5VDC power supply consuming less than 1000mA of current or less making it ideal for a USB connection. Originally designed for fast communication between computers and peripherals, the USB port has led to the rapid development of many new 5 volt devices which along with USB plugs and sockets are able to recharge tablets, smartphones and other such small devices. One point to note is that devices which are designed to generate heat, usually require large amounts of electrical power so are better suited to mains or much larger solar power systems. Pico solar systems and products have many positive advantages over the more traditional photovoltaic solar systems as they are smaller, cheaper and light weight compared to other forms of solar power systems. Today there is an almost endless list of electronic devices which operate consuming small amounts of power and which can therefore be recharged using pico solar systems. Many pico solar devices and products have their own rechargeable battery built-in which in turn is charged up by the pico-PV cell storing the free solar power for later use. Advances in new smartphone technology means that now mobile phone networks and coverage is all across the globe, far beyond the reaches of a mains electricity grid. The result is that many people can make a phone call from anywhere on the planet, but can not easily recharge their phone or are forced to pay others who have access to electricity to charge it for them. Pico solar chargers overcome this problem by allowing portable devices such as phones, mp3 players, radios and cameras to be recharged anywhere around the world as long as there is sunlight. However, the small and portable nature of these chargers means that the solar panels used are also small sometimes taking a long time to recharge them. Pico Solar Systems have come a long way in the last few years with smaller more affordable devices available with built-in solar modules for recharging batteries or for powering LED lighting now being stocked as standard in most high street stores. Pico solar systems have the power to provide useful amounts of clean, renewable electricity without the need of the electricity grid. But above all pico solar systems allow people living in rural and poverty stricken countries to have access to free solar power and lighting without being forced to rely on expensive, outdated and poor quality electrical grids or networks, thereby helping them to improve their lives in so many different ways and without the need to sit in darkness every single night. To me, solar and wind power were relatively easy to do myself. I just read up and got the gumption. The debt was paid off in 4 years. That was when it was a lot more expensive for many components, especially the pv panels. Instead of one big PV panel I used smaller panels to power different parts of the house.